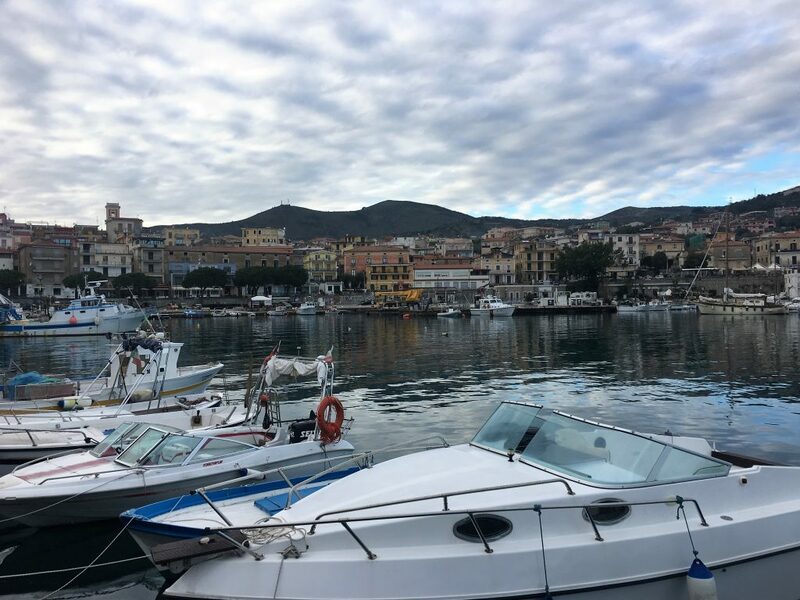 We stayed in Marina di Camerota for two very different nights. On Friday night we were joined by a couple of Italian motorhomes in the big carpark behind the beach and had a peaceful night’s sleep. On the Saturday night the Italian motorhomes had left us alone in the carpark and we spent a couple of hours being the obstacle in a boy racer’s playground. It was only one car with a young driver and his girlfriend taking it in turns to speed up and down, do handbrake turns and screech donuts around us. Paul watched from our bedroom window, probably reliving his youth, and after a while they left us in peace. That’ll teach us to be wary of large empty carparks on Saturday nights. 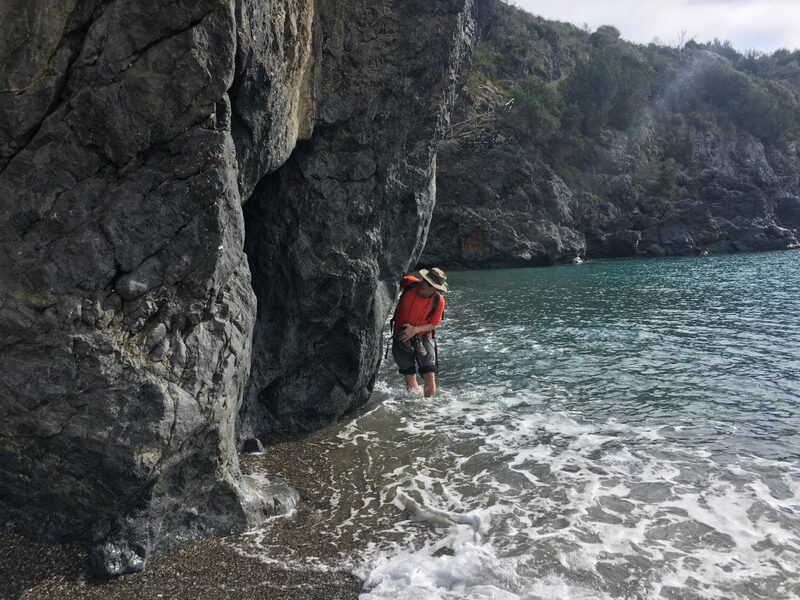 During the day we took another coastal walk to visit four beaches; the long sandy beach at Marina di Camerota that is split in two by a small rocky promentory, and the steep sided coves of Calas Pozzallo, Bianca and Infreschi. In fact we didn’t end up getting as far as Infreschi, having been captivated by the two other beaches. One day we may come back and walk in to Cala Infreschi from the other direction. This coastline here is still part of the Cilento national park and is stunning. 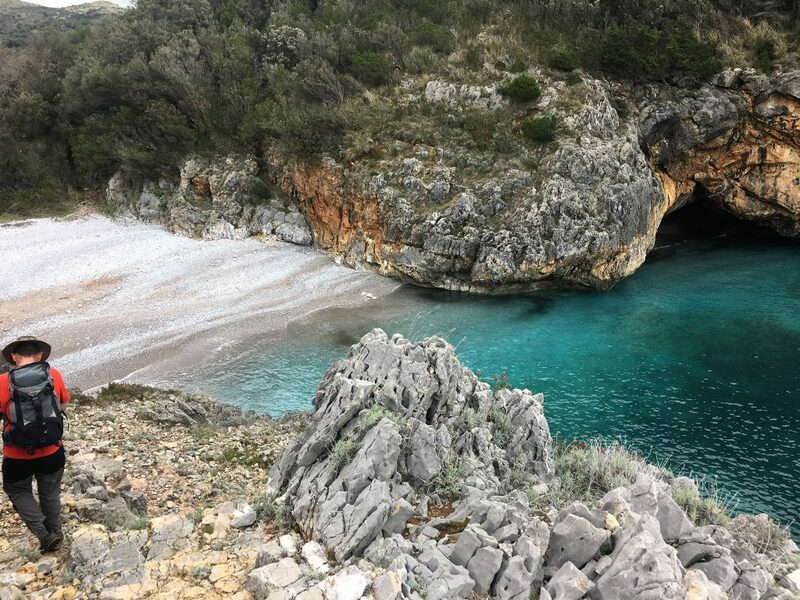 The cliffs are steep and wooded and the path strays inland to avoid obstacles but when it hits the coast you are rewarded with limestone cliffs, wave cut caves and brilliant blue water. 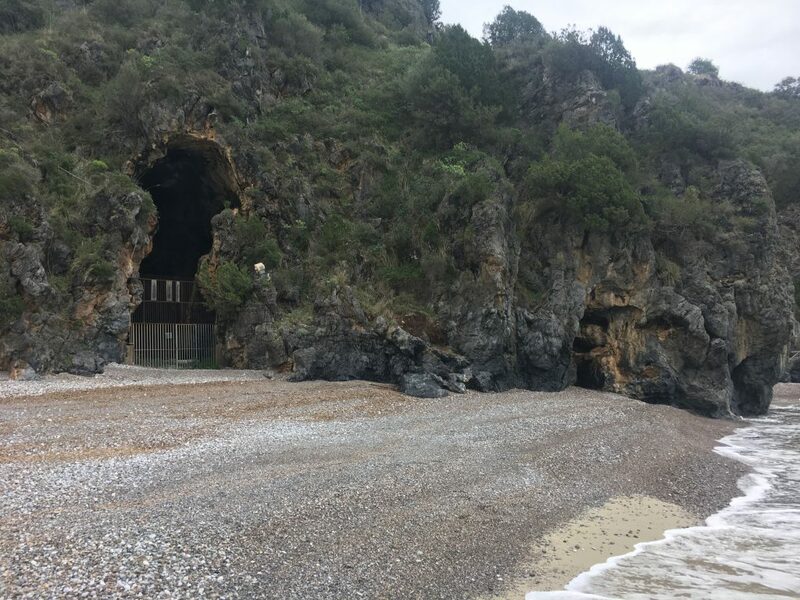 As we walked east of the carpark we encountered the first cave, a tourist attraction just behind the headland that divides the beach. This was gated and closed for the low season but we could read the boards that explained the Neaderthal and early Homo Sapiens habitation of the site. At the far end of the beach was the town’s cemetery and the path heads up through the wooded cliff beyond this, marked with red and white slashes. We had considered an alternative route closer to the cliff edge that we had seen from the far end of the beach, but didn’t realise that it would involve wading through the sea for a couple of yards, so decided to leave that for the return. The path took us up through the woods and then onto tracks past olive groves, farm buildings and villas. We took a wrong turn at one point, keen to get off the main track we headed down a path through olive trees only to reach a dead end where a couple were clearing undergrowth from around the trees. They directed us back up to the track where we kept a closer eye out for the route markers. 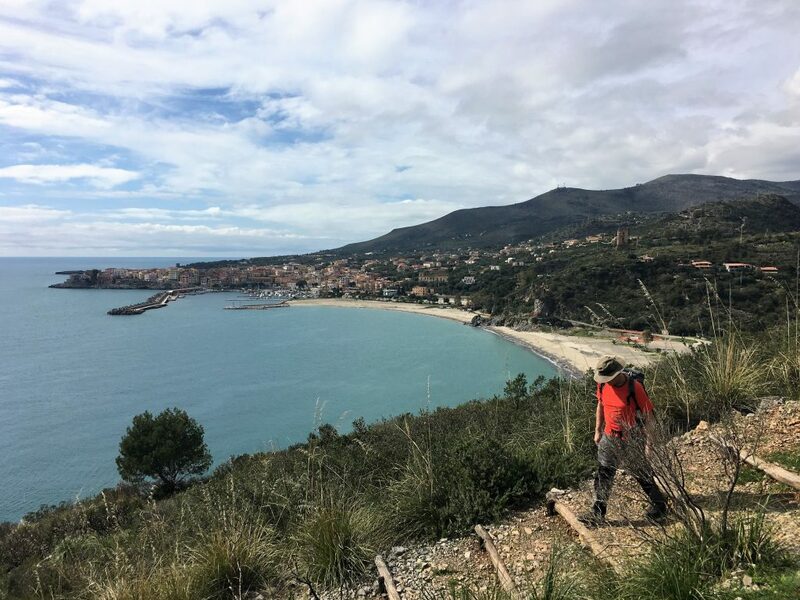 The day was turning out to be pleasantly sunny and warm and so we stopped to enjoy some sun when we reached the pebbly beach at Cala Pozzallo. The walk down here had taken us past a small patch of agricultural land where dogs yapped at us (not an uncommon occurrence here) and a rather nice beach bar (closed). The beach had the look of somewhere that is visited mostly by boat as one of those ‘visit a deserted beach but actually you can rent chairs and umberellas and get a cocktail once you’re there’ destinations. Once we managed to tear ourselves away from here we took another detour inland before dropping down to Cala Bianca, this time walking out to the headland west of the beach before clambering down over the sharp limestone rocks to the beach. Again we stopped to enjoy the good weather, eating our lunch while sat on the rocks above the cove and sharing our bread with the voracious fishes that were swimming beneath us. It was at this point that we had to turn around in order to ensure we got back to Bertie in time to watch the rugby. 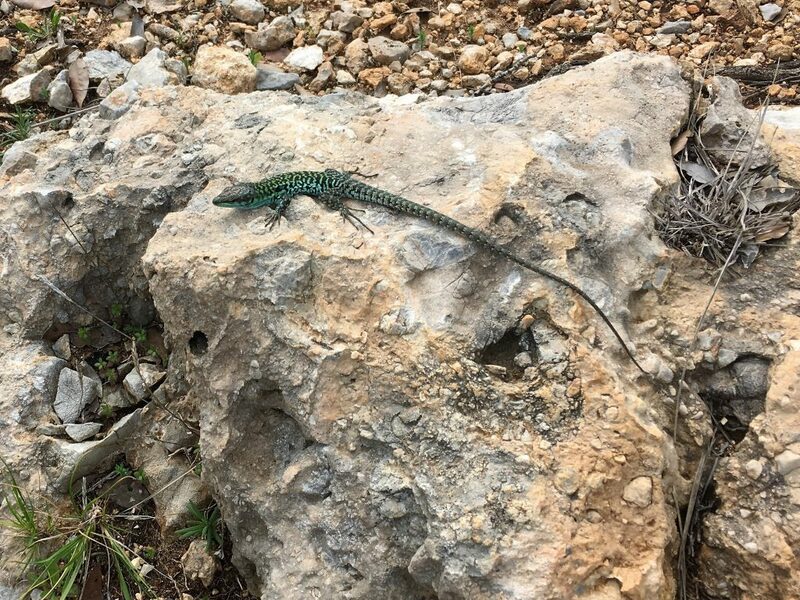 The walk back was much quicker, along the way we kept an unsuccessful eye out for wild asparagus and had more success spotting many jewel toned lizards basking in the heat of the day. This time we did get our feet wet as we walked to the end of the headland where a watchtower looks out over the bay before dropping down many steps to a tiny cove where we had to wade around the corner and back onto the sandy beach. That afternoon we watched rugby while eating scrumptiously light and sugary ciambella (doughnuts) that I had bought from the bakery that morning.